Fully automate onboarding, provisioning/setup, recurring billing, usage billing, debt collection, credit management, pro-rata changes, setup charges, pro-rata service change fees, termination, early termination fees, credit card surcharges, late fees, usage caps, overage charges, and more. Services which have been fully integrated into Smile software’s policy management framework benefit from policy control and enforcement which can be applied in real time based on service level (plan) changes, payment status, overdue status, service termination and more. Overdue payment? Bar, throttle, suspend, or otherwise take action – automatically. Too much data downloaded? Throttle the customer or use a DPI appliance to restrict certain protocols. Or, bill for the excess usage. Too many international calls? Restrict calls until the billing cycle is done. And if a customer upgrades their plan after too much use, Smile will automatically restore service – in real time. Integrated services also benefit from automatic setup/teardown, automatic vendor reconciliation, automatic usage mediation, and statistics gathering. 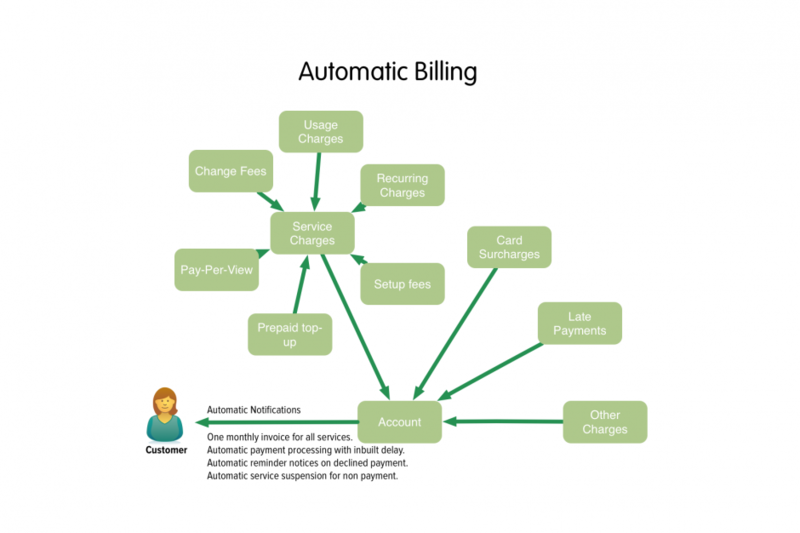 Smile automates the entire billing process by automatically producing all of the common types of charging required by a modern billing process. These charges include usage charges, recurring charges, setup charges, pay-per-view, pay-per-use, top-ups, service change requests, up/downgrades, credit card surcharges and late fees. 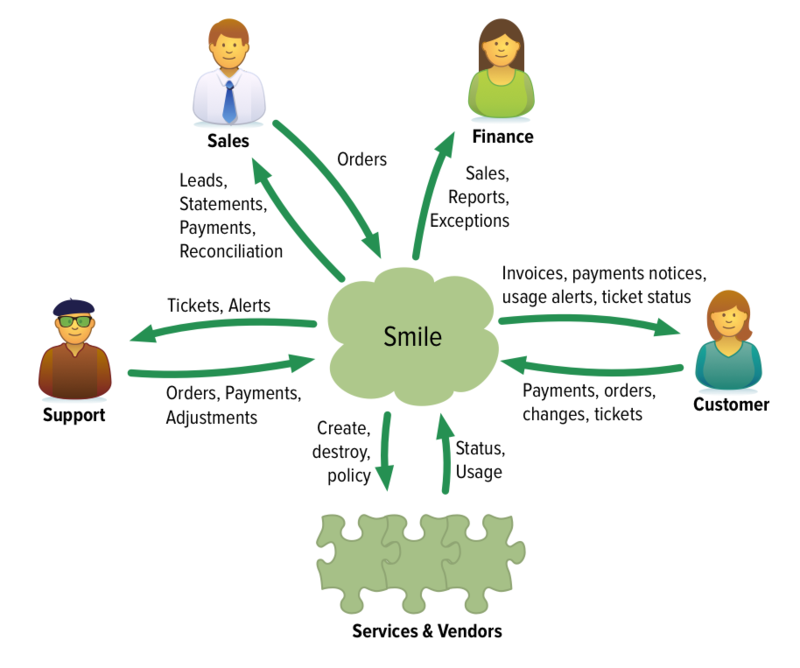 Smile can even accept complex billing data sent from other systems, and queue it for the end of month invoice. Smile makes the debt collection and management process easy and transparent and automatic for post-paid account holders. Smile’s collection cycle is flexible and dynamic. 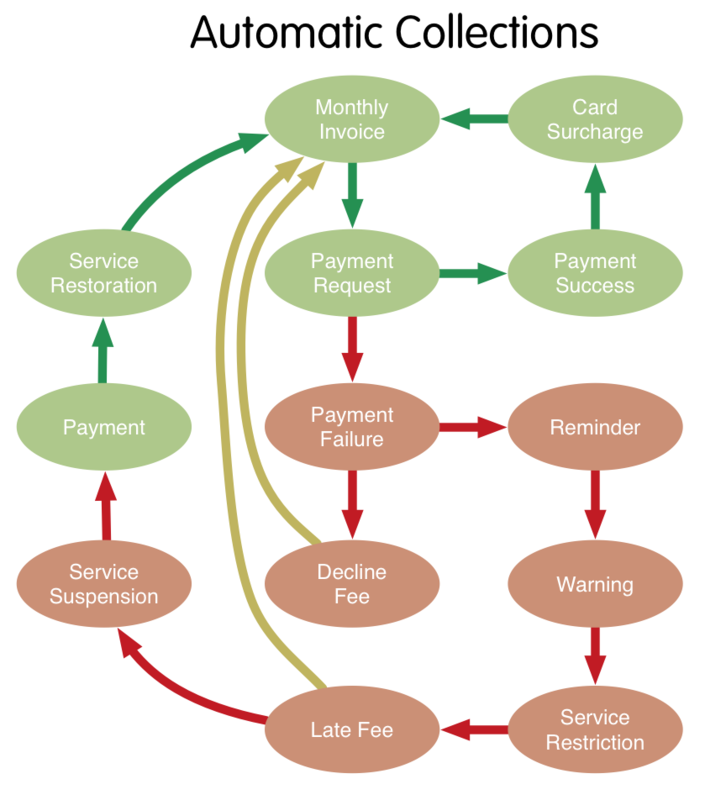 Customers who pay late are progressed through a variety of steps until their service is disconnected. You can automatically add late fees or push service policy changes to the service, at any step of the cycle – for example, to suspend or restrict service. Send pre-due reminder notices to give people a little hurry-up as an invoice becomes due. If a customer pays using a credit card then Smile will automatically calculate a surcharge for the card payment and either apply that charge immediately, or add it to their next invoice. Smile has a sophisticated notification mechanism for informing customers of invoices, payment problems, excess usage, and more. 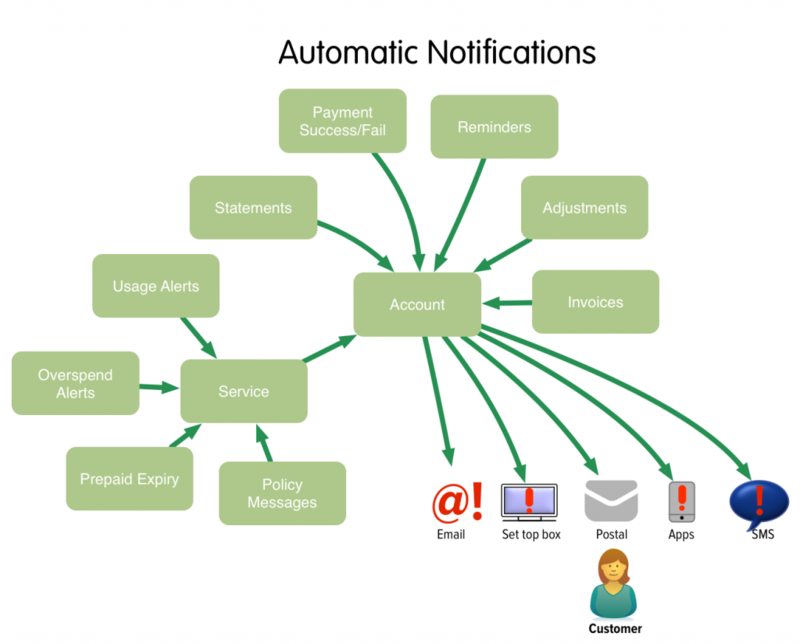 Notifications can be sent via SMS, email, or through your own notification mechanism. If there’s an App for That, Smile software can talk to it. Fully automated customer self-service portals reduces helpdesk load, reduces or eliminates handling errors, and avoid revenue leakage – while improving speed, consistency, convenience and reliability for all customers. At Inomial, we understand that your portal is central to your customer experience. So rather than providing you with our idea of what a portal should look like, we provide you with a broad suite of cross-platform APIs for developing your portal the way you want it to be. Our self-service APIs allow end-users to sign up, sign in, add services, up- and downgrade plans, cancel services, view and pay accounts, buy prepaid credits, view usage, raise helpdesk tickets, and more. Authentication: Our Portal APIs allow multiple unique portal users per account, each with potentially different access levels. 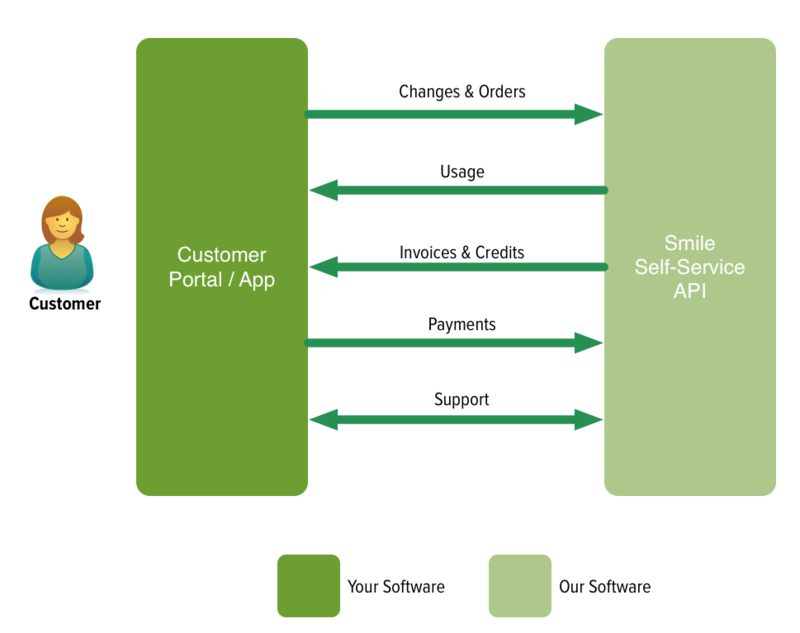 Smile’s APIs for authentication and access control make it easy to integrate sophisticated billing and service management services into your existing customer portal. Plan Changes: Our APIs allow customers to upgrade or downgrade plans in strict accordance with predefined business rules. Smile will also enforce contract rules and will correctly calculate billing adjustments for changes. Changes can be charged immediately by credit card or at the next invoice date. Business rules may require upgrades and downgrades to be scheduled at any time in the future, and supports independent up-, down- and cross-grade charges. Termination: Our APIs allow customers to terminate service based on predefined business rules. Rules include minimum notice times, automatic calculation of early termination fees, termination prohibition rules, and more. Of course, you can also bump a termination request to the retention desk. Account Management: With our APIs, customers can view their accounts, download original PDF invoices, make one off purchases of digital or physical goods, view their per-service usage, purchase pre-paid access blocks, and much more. Adjustments: Smile’s sophisticated pro-rata billing mojo ensures that regardless of the type of change, the next invoice sent to the customer will always be correct. Our customers – and yours – depend on it. Incentivise your sales force with automatic, multi-layered leading and trailing commissions. Paid only on receipt of payment from the end-user, Smile provides all the tools necessary to provide your sales team with payment statements, payment history, reimbursement, clawbacks and reconciliation. Service aggregation, automatic policy management, provisioning automation, easy billing, exception reporting, help desk and ticketing, workflow management… Smile provides a one-stop shop for service integration and automation. We’re here to help. We provide complete documentation for all Smile features, as well as group and one-on-one training sessions for your team. Our generous support policies ensure that you get the most out of Smile.